The new text (10 December @ 21.00) has improved language on long-term-goal and ambition mechanism, but early revision of NDCs is not ensured. This is a good compromise, as the term greenhouse gas emissions neutrality is much clearer than “climate neutrality” that was in the previous draft. The peaking language is a nice, although not very specific, addition. The new text has improved provisions for raising ambition in the period after Paris. It starts with a “facilitative dialogue” before the entry into force of the Paris Agreement in 2019 to “take stock of collective efforts” in relation to the long-term goal, with the purpose of informing the preparation of future NDCs. This builds upon a whole range of provisions in Decisions IV.114-140 that strengthen the actions in the pre-2020 period, including a commitment “to ensure the highest possible mitigation efforts in the pre-2020 period”. The big question is by when the current NDC should be revised. Article 3.8 says “every 5 years”, but as the Agreement will only enter into force in 2020 and the first global stocktake will happen in 2024, that means not before 2025. Article 3.8: Parties shall communicate an ### every five years in accordance with decision X/CP.21 and any decisions of the Conference of the Parties serving as the meeting of the Parties to the Agreement being informed by the outcomes of the global stock take referred to in Article 10. However, Decisions III.23 and III.24 add a provision that “invites” parties to already submit a new NDC by 2020. So this could bring the revision (and strengthening) forward, were it not that it is only an “invitation”, not a requirement. There is another element in the decision that seems to push revision (and strengthening) into the longer term, namely Decision II.17 that says that greater emission reduction efforts will be required AFTER 2025 or 2030, which is a sure way of missing the 2oC limit. Provisions for strengthening successive NDCs look ok.
3.6 Each Party’s successive ### should represent a progression beyond the Party’s previous efforts and reflect its highest possible ambition. 3.8 A Party may at any time adjust its existing ### with a view to enhancing its level of ambition. An important element of a procedure for review and strengthening of NDCs is the reporting on implementation. The provisions on this are fairly general, such as “promoting environmental integrity, transparency, etc” and “avoid double counting” (in case use is made of market mechanisms). Further guidance by the Conference of Parties (to be prepared by the Ad Hoc Working Group on the Paris Agreement as stipulated in decision III.28) is foreseen. 3.12 Parties shall account for their ###. In accounting for their ###, Parties shall promote environmental integrity, transparency, accuracy, completeness, comparability and consistency, and ensure the avoidance of double counting, in accordance with guidance adopted by the Conference of the Parties serving as the meeting of the Parties to the Agreement. Finally a provision is included in article 3.22 that says that Parties “should strive to formulate …. long term low-emissions development strategies”. This would help countries to think about the necessary transitions in the energy, transport, buildings, agriculture, forestry and infrastructure sectors and would facilitate identify the strengthening of their short and medium term mitigation and adaptation efforts. Unfortunately no further guidance or support for these efforts is included. 3.22 All Parties should strive to formulate and communicate long-term low-greenhouse gas emission development strategies mindful of Article 2 of this Agreement taking into account Parties different national circumstance and development stages. Option 1: Parties collectively aim to reach the global temperature goal referred to in Article 2 through [a peaking of global greenhouse gas emissions as soon as possible, recognizing that peaking requires deeper cuts of emissions of developed countries and will be longer for developing countries; rapid reductions thereafter to [40–70 per cent][70–95 per cent] below 2010 levels by 2050; toward achieving net zero greenhouse gas emissions [by the end][after the middle] of the century] informed by best available science, on the basis of equity and in the context of sustainable development and poverty eradication. Option 2: Parties collectively aim to reach the global temperature goal referred to in Article 2 through a long-term global low emissions [transformation toward [climate neutrality][decarbonization]] over the course of this century informed by best available science, on the basis of equity and in the context of sustainable development and poverty eradication. The advantage of the first option is that it specifically mentions the net zero GHG emissions target that needs to be met for a 2oC limit by the end of the century, according to IPCC AR5 and repeated in the UNEP Emissions Gap report 2015. This is much clearer than the formulation in option 2 that talks about “climate neutrality”. That climate neutrality wording also leaves open the possibility of meeting this target by large-scale insertion of aerosols in the upper atmosphere (geo-engineering). The “decarbonisation” wording in option 2 is in fact incompatible with a 2oC limit: for all GHGs to be net zero by the end of the century, CO2 emissions should already be net zero much earlier: between 2060 and 2075 (see UNEP Emissions Gap Report 2015). And for a 1.5oC limit that many countries favour, the net zero CO2 emissions should already be reached by 2050. The decarbonisation language is therefore wrong. The so-called ambition mechanism is necessary, since the collective effect of the submitted INDCs is at best limiting the long-term temperature increase to 3-3.5oC (UNEP Emissions Gap report 2015). The Emissions Gap in 2030 is estimated to be 12-14 GtCO2e. Waiting to 2025 or 2030 with strengthening the mitigation efforts is a sure way to miss the 2oC limit. The text of the agreement addresses this in 3.6 by emphasizing progression in subsequent INDCs. In 3.8 a 5 year cycle is mandated, but only after the first so-called stocktake that article 10 sets for 2023 or 2024. And 2bis.4 adds another barrier, i.e. it says that successive INDCs will be communicated before the expiry of the previous INDCs. In other words, for INDCs that only have a target for 2030, like the EU, a new INDC would only be required after 2030. 3.6 Each Party’s successive ### [shall][should][will] represent a progression beyond the Party’s previous efforts and reflect its highest possible ambition [based on common but differentiated responsibilities and respective capabilities, in light of different national circumstances]. 3.8 Parties shall communicate an ### every five years in accordance with decisions of the CMA being informed by the outcomes of the global stock take referred to in Article 10. Decision II.20 adds another requirement to have a first stocktake before the new agreement enters into force in 2020, namely a “facilitative dialogue” in 2018 or 2019, without any stipulation that such a stocktake should lead to strengthening the INDCs. And, surprisingly, decision II.17 states that “greater emission reduction efforts .. will be required in the period after 2025 and 2030…”. This is a sure way of missing the 2oC limit (let alone a 1.5oC limit), because it would then be impossible to close the very big 2030 emissions gap mentioned above. Strengthening efforts should happen much earlier, even before 2020 to have a chance of returning to a 2oC trajectory. Then there are two other elements that could have an impact on the strengthening of ambition. Article 2bis.3 is a disclaimer for developing country INDC implementation and strengthening by referring to ill-defined “implementation of developed country Parties of their provision of finance and technology”. Without having an agreed level of support for individual INDCs this is an open invitation to do less. 2bis.3 The extent to which developing country Parties will effectively implement this Agreement will depend on the effective implementation by developed country Parties of their commitments on the provision of finance, technology development and transfer and capacity-building. The second element is an invitation to countries to develop and communicate long-term low-emissions development strategies. This would be helpful for countries to strengthen their INDCs, but by making it purely voluntary and not connecting it with financial and technical support this is currently a very weak provision. 3.21 All Parties should voluntarily formulate and communicate long-term low-emission development strategies. All in all, the conclusion must be that the ambition mechanism in the current text is still very weak. Is there a Reality Gap in the UNEP Emissions Gap Report? The latest UNEP Emissions Gap Report (EGR) has been criticized for (1) maintaining that we can still keep global mean temperature increase below 2 degrees, although actual emissions are still rising, and not peaking by 2020 as considered necessary by science earlier, (2) for making very challenging assumptions for possible future emission reductions, in particular through negative emissions and (3) for making politicians believe in something that is no longer realistic. The first point that is made is that earlier EGRs stated that global emission levels in 2020 could not be higher than 44 GtCO2e (range 38-47), if we would want to keep long-term temperature increase below 2oC, while projected emissions based on pledges and implementation thereof are clearly going to be higher. Nevertheless the 2014 and 2015 reports maintain that the 2oC limit can still be met if global emissions by 2020 are higher than that, provided that by 2030 they are below 42 GtCO2e. What actually happened? In the 2010, 2011, 2012 and 2013 reports, the scenario set from the IPCC Fourth Assessment (AR4) Report was used that had no scenarios that attempted to keep temperature increase below 2oC with action not starting immediately (2000 or 2010 in this case). From these scenarios, the 44 GtCO2e in 2020 is derived. By 2014 new scenario sets from the IPCC Fifth Assessment (AR5) Report were available that assumed delayed action till 2020 (more or less consistent with the 2010 Cancun pledges that countries made), followed by stringent reductions thereafter. These scenarios were not longer following the “least cost” trajectory as of 2010 that all of the IPCC AR4 Report scenarios did. As a result there were now solutions available that postponed action, as long as emission levels by 2030 would be kept below 42 GtCO2e. So this is clearly a matter of new scientific insights. The second criticism is that these IPCC AR5 scenarios rely on substantial negative emissions in the second half of the century and that these negative emissions are supposed to be achieved predominantly by using biomass power plants with CO2 Capture and Storage (BECCS) at a very large scale. BECCS is a technology that has only been demonstrated at small scale, is currently quite expensive, requires large amounts of sustainable biomass that may not be available and would therefore never deliver the significant negative emissions that the scenarios assume. What are the facts? The IPCC AR5’s 2-degree scenarios that are used as a reference in the 2014 and 2015 EGR all follow the Cancun pledges till 2020 and then a least cost reduction path thereafter. They all assume a >66% probability of meeting the 2oC limit. As already two thirds of the available carbon budget for a 2oC temperature increase has been used up and there are limits in how fast emissions can be reduced in the future, all scenarios assume negative emissions in the second half of the century from afforestation and particularly from BECCS. The cumulative amount of CO2 storage in these scenarios ranges from about 400 to 800 GtCO2. The amount of CO2 removal through BECCS is lower. The amount of biomass that is needed for the use of BECCS is in the order of several hundred Exajoules. The combination of biomass as fuel and CCS is not particularly challenging. So two issues need to be considered: the penetration of CCS at scale and the availability of sustainable biomass. Could power plant CCS penetrate from the current scale (1 million t/yr in the Boundary Dam power plant in Canada) to reach the cumulative scale of at least 400 GtCO2 by the end of the century? A simple exponential growth curve with a growth rate of 15-20% per year can do this in a period of 85 years. Growth rates of solar and wind power have been higher than this over the last 10-15 years, also in a situation where these technologies were significantly more expensive than fossil fuel based energy supply. And China built 2 coal-fired 600 MW power plants per week between 2005 and 2011. Integrated Assessment Models base their assumptions of penetration rates on historic data. The IMAGE model has an upper limit for BECCS of 10 GtCO2/yr by 2050 and 20 GtCO2/yr by 2100, which would allow having a cumulative amount of negative emissions over the century of about 900 GtCO2, much more than what would be needed. Would sufficient amounts of sustainable biomass be available? The IPCC AR5 estimates the available biomass to be 10- 245 EJ/yr by 2050 and 105-325 EJ/yr by 2100. The AR5 scenarios for staying below 2 degrees assume amounts of available biomass energy that are lower than these maximum values. And biomass is not only used for BECCS, so the amount needed for BECCS will be even lower. Producing all the required biomass of this would require a substantial percentage of agricultural land; a recent assessment indicated that for 100 EJ/yr 30% of cropland and 10% of crop and pasture land combined would be needed. However, waste streams can already deliver significant amounts of biomass (ref), biomass can be grown on marginal lands that not compete with food production (ref) and productivity of biomass production (amount/hectare) can be further increased. Conclusion: the amounts of sustainable biomass that would be needed for large-scale application of BECCS can most likely be delivered in a sustainable manner. Last but not least, negative emissions can also be realised by enhanced afforestation and reforestation and revegetation of degraded lands. If those options are further developed they would reduce the amounts to be removed through BECCS. Conclusion on BECCS assumptions in the IPCC AR5 scenarios: plausible, but challenging to realize. The third criticism is that the EGR would make it seem easy to still meet the 2oC limit and thus provide an incentive for politicians to postpone action in the short time. What are the facts? EGRs have consistently warned against delay, based on the risk of locking in carbon intensive infrastructure, higher costs, more serious climate impacts, missed co-benefits for health, energy security and employment and also very specifically the risk of relying on large amounts of negative emissions through technologies that have not yet been demonstrated at scale. So they have certainly not encouraged politicians to delay action. Importantly, no attempts were made to model scenarios that limit warming to below 2°C from Cancun pledge levels in 2020 in the absence of BECCS. The absence of such scenarios thus does not imply that they could not be generated. REVISED The collective impact of INDCs: why are there such different estimates for long-term global mean temperature increase? More than 160 countries have submitted Intended Nationally Determined Contributions (INDCs) to the UN Framework Convention on Climate Change ahead of the Paris Conference of Parties. Research groups have published what these INDCs collectively mean in terms of the 2025 and 2030 global emission levels and the corresponding implications for long-term global mean temperature. Two high-profile UN reports have summarized this research: the UNFCCC Synthesis Report and the UNEP Emissions Gap Report. The common message of these publications is that INDCs are bending the curve of global emissions, lead to a lower 2100 global temperature than with current policies and are not enough to be on track to keeping global mean temperature increase below 2oC. However, estimates of what 2100 global mean temperature increase is implied in the collective INDCs vary considerably. The most widely quoted numbers are as follows. The Climate Action Tracker estimated an increase of 2.7oC (range 2.2-3.4) by the end of the century. The Climate Interactive team estimated 3.5oC, and IEA came up with an estimate of 2.7oC as well, all for unconditional INDCs only. The UNEP Emissions Gap Report, which assesses all available research findings, estimated 3.5oC (range 3-4) if looking at only unconditional INDCs and 3oC if including conditional ones as well (no range is given for this number, but it can be assumed it is comparable to the range for the unconditional INDCs, i.e 2.5-3.5). A more comprehensive overview and analysis has been published by WRI . 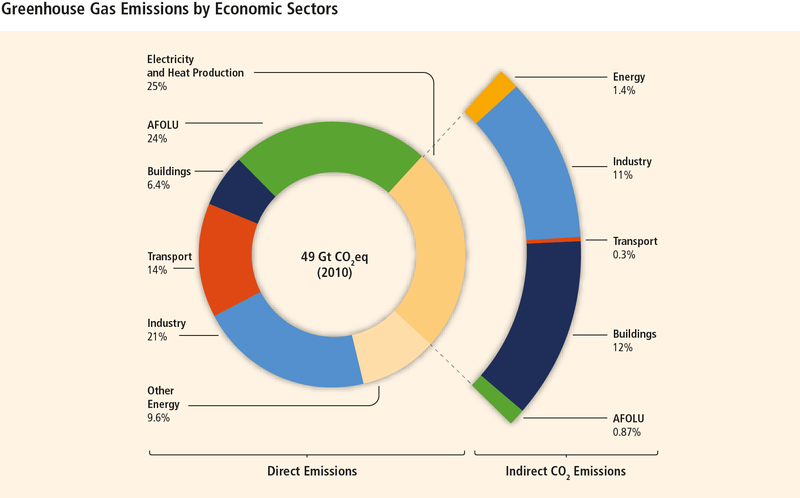 Individual estimates of global emission levels from implementing INDCs differ. Many of the INDCs submitted by countries do not specify 2025 or 2030 emission levels as a result of the INDC, so these emission levels need to be calculated, requiring certain assumptions to be made. The UNEP Emissions Gap report shows that between research groups there can be a difference of more than10%, with the CAT estimates being on the low end of the range. Some research groups include all INDCs, unconditional and conditional ones, but others only include unconditional ones. The difference, according to the UNEP Emissions Gap Report is about 2 GtCO2e. The calculation of long-term temperatures for a given global emission level differs. The 2100 temperatures depends not only on the 2025 and 2030 emission levels, but more on what happens with emissions thereafter. Different methodologies are used,,. The Climate Interactive assumptions for post 2030 action are much more conservative than what others have done. The definition of the statistical chance of staying below a certain temperature level differs. Due to the uncertainties in translating an emission level into a global mean temperature increase, it makes a difference if the threshold is defined as a 50% chance of staying below a certain temperature or as 66% or 90% chance. The UNEP Emissions Gap Report uses a 66% chance as the definition of the threshold. Their finding that with 66% chance INDCs will keep temperatures below 3.5oC (for unconditional INDCs). The IEA and CAT findings that there is a 50% chance that temperatures will be kept below 2.7oC is equivalent to a 66% chance below 3oC. So, when looking at the factors discussed above, it can be concluded that there are three main reasons for the differences: (1) the definition of the statistical threshold: (2) the difference in assumptions about post-2030 action; and (3) the estimate of the emission levels in 2025/2030 implied in the INDCs. The approach followed by the UNEP Emissions Gap Report (66% probability, looking at selected scenarios from the IPCC database for the post-2030 assumptions, and averaging the emission levels found by different research groups) gives a good basis for assessing the long-term temperature implications of the INDCs: 3.5oC for only unconditional and 3oC for conditional and unconditional pledges. The Summary for Policy Makers (SPM) of the IPCC Working Group on Mitigation to the 5th Assessment Report ( see http://report.mitigation2014.org/spm/ipcc_wg3_ar5_summary-for-policymakers_approved.pdf ) was approved and the full report was accepted by the IPCC Plenary on April 12 (see http://mitigation2014.org/report/final-draft/ ). What are its main messages? Are these the messages that policy makers need to know? And what is not being said? 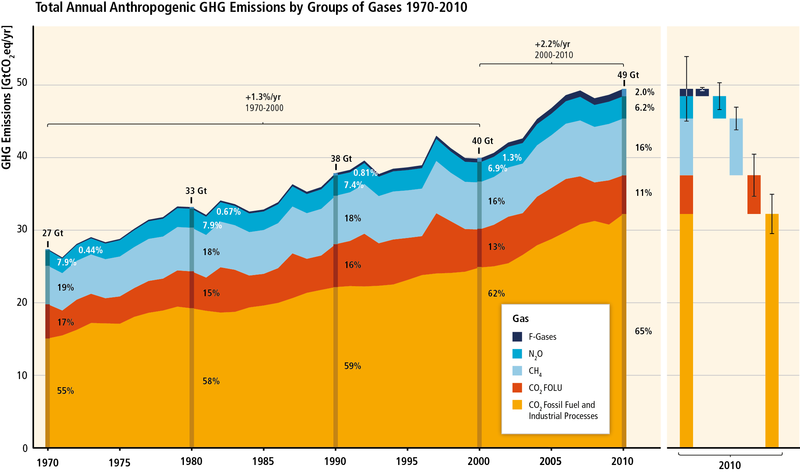 Greenhouse gases emissions are rising faster than ever before. Between 2000 and 2010 global GHG emissions rose with 2.2% on average, despite an increasing number of countries implementing emissions reduction policies. Between 1970 and 2000 the increase was 1.3% per year. Total GHG emissions are now 49 Gigaton CO2 equivalent. The carbon content of energy has increased over the last decade, reversing a declining trend since 1970. This is caused by a sharp increase in the use of coal. It dwarfed the emission reductions from the significant increase in the use of renewable low-carbon energy sources that in 2012 represented more than 50% of the new power capacity added to the global grid. Current trends are expected to lead to a 4-5°C increase of global temperatures by 2100, compared to pre-industrial levels, with further increases thereafter. Without further mitigation action beyond what is in place today atmospheric greenhouse concentrations are expected to rise till 750-1300 parts per million of CO2 equivalent by the end of the century, corresponding to 4-5°C higher temperatures than pre-industrial ones. Concentrations and temperatures will further increase after 2100. Current emission reduction efforts fall short of a cost-effective path to keep temperature increase below 2°C, the limit unanimously agreed by countries in 2010 in order to avoid unmanageable risks of climate change. Can temperature rise still be kept below 1.5 or 2°C? All countries of the world agreed in 2010 that temperatures should not increase more than 2oC above pre-industrial, preferably even 1.5°C. With the current trend pointing to 4-5°C or more, will that still be possible? Many scenario studies confirm that it is technically and economically feasible to keep temperature rise below 2°C, with 70% probability (”likely chance”). This would imply limiting atmospheric concentrations to 450 ppm CO2 equivalent by the end of the century. If a 50-50 chance of staying below 2°C would be acceptable, then the concentration limit is 500 ppm (provided the overshoot in the interim is not beyond 530 ppm). Such scenarios for a 70% chance imply halving global emissions compared to 2010 by mid-century and zero or negative emissions by 2100. Depending on the degree of delay in reduction efforts the reduction is 40-70% below 2010 by 2050. For a 50-50 chance of staying below 2°C these numbers are going down only a little: 25-55% % emissions reduction. By the end of the century net emissions have to be zero or negative, implying large removals of CO2 from the atmosphere by bioenergy with CCS (BECCS) or afforestation. Keeping global temperature increase below 1.5°C would require even lower atmospheric concentrations (<430 ppm) to have a little more than 50% chance. There are not many scenario studies available that can deliver such results, requiring even faster reductions in the medium term, indicating how difficult this is, given where we are now. Scenarios that keep temperature increase to less than 2°C with a likely chance, show rapid increases of energy efficiency, a huge increase in low carbon electricity generation (to 60% share by mid-century) and extensive use of CO2 capture and storage – CCS). Large amounts of renewable energy, nuclear power, fossil fuel power plants with CCS and biomass fueled plants with CCS (BECCS), will be needed to realize the massive emission reductions (more than 90% by mid-century) in the energy supply sector, a huge transition operation. Average global macro-economic costs of such reduction pathways that minimize costs over the century are modest compared to expected economic growth, and economic co-benefits and avoided climate change impacts more than compensate for these costs in most countries. Under a cost-effective approach, implying mitigation action in all countries starting immediately, a global carbon price and all key technologies applicable so that costs over the century are minimised, macro-economic costs of a 2°C scenario are limited: an average annual reduction of consumption of about 0.04-0.14 percentage points (from a baseline increase of consumption of 1.6-3% per year). Under practical conditions where ideal conditions do not apply, costs will be higher. There are many co-benefits of pursuing a 2°C scenario (in particular reduced health and ecosystem damages due to reduced air pollution and improved energy security, but also for instance biodiversity conservation, food security and employment ) that in many cases provide a net economic benefit, even accounting for potential negative side-effects. The report unfortunately does not quantify them. The economic costs of climate change impacts (not mentioned explicitly) was estimated in the IPCC Working Group II report (see http://ipcc-wg2.gov/AR5/images/uploads/IPCC_WG2AR5_SPM_Approved.pdf ) at least at 0.2-2% annually by mid-century. The report confirms that technologies and practices for all economic sectors are available to bring emissions down in line with cost-effective 2°C scenarios. Energy efficiency improvements that lower energy demand are an essential element of mitigation strategies for keeping temperature increase below 2°C. The potential of end-use energy efficiency improvement in transport, buildings and industry is large: at least about 40-60, 30-60 and 30-50% respectively by 2050, compared to the baseline (see figure 6.37). Clear cost numbers are not available. The carbon intensity of energy carriers will of course determine the overall emission reduction. Changes of human choices in transport modes, diet, energy use in households, and purchasing long-lasting products can also have a large contribution to emission reduction. The potential is very hard to quantify. 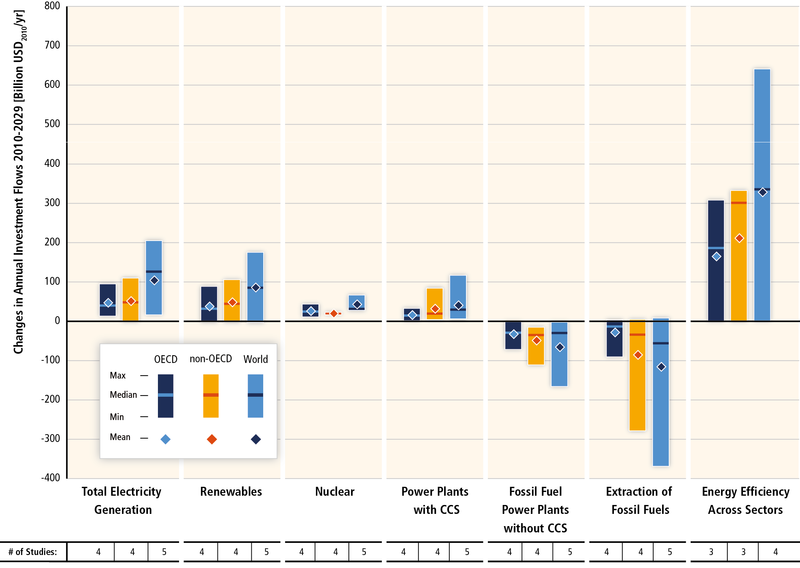 In the energy supply sector the significant cost reduction of renewables and the sharp increase in volume are a positive development, but increased coal use, a declining share of nuclear power and lack of progress with application of CCS is limiting progress towards decarbonisation of electricity supply. The potential for a 90%+ reduction of emissions by mid-century is there, with fossil fuel with CCS and bioenergy with CCS (BECCS) being critical technologies to keep costs down. Leaving nuclear power from the technology mix has a much smaller impact on cost increase. What the report– unfortunately- does not say is that new coal fired power plants without CCS are incompatible with 2°C scenarios. It is a direct consequence of the fact that the cumulative CO2 emissions budget consistent with 2°C has been used up already too much to allow for new long living coal fired power plants. See http://www.europeanclimate.org/documents/nocoal2c.pdf. This is a very relevant point for policy makers dealing with energy supply, since new coal fired power plants are still being planned in large numbers. What the report does say is that natural gas without CCS can have role as a transition fuel in the medium term. It means in the longer term CCS will also be essential for natural gas fired power plants. Available technologies and practices in the transport sector will allow an emission reduction of 15-40% below baseline by 2050, while transport demand growth would otherwise lead to doubling of emissions. Cost numbers are not available. Measures will be combination of technical improvements in vehicle design, low-carbon fuels, mode shifts for passenger and freight transport, as well as urban planning to reduce the need for transport and make it easy for people to walk or cycle. In buildings there are big opportunities for emission reduction in new and renovated building at low or sometimes at negative costs, but they have not been quantified. Given the long life of buildings, delaying action will lead to lock-in of inefficient new buildings that will be very costly to renovate later. In developed countries changes in lifestyle and behavior could halve energy demand by mid-century compared to today. Industry, the biggest emitting sector, has significant opportunities to improve energy efficiency, efficiency of material use, recycling and reuse in the short term, allowing emissions to get below a fast growing baseline. Many of these opportunities will be made attractive by regional collaboration between industries. For more significant reductions in the longer-term radical process and product innovations, low carbon electricity and application of CCS in cement and steel production will be needed. Emissions from agriculture and forestry have stabilized and are now declining, mainly due to a reduction in deforestation rates and increased forest planting. Further reductions are possible. Reductions of about 75% of current emissions can be achieved by afforestation, sustainable forest management, reducing deforestation, cropland and grassland management and restoration of degraded soils. Urban areas provide unique opportunities to deliver reductions from integrated transport, building and infrastructure measures and reap many other social and economic benefits. Urban areas cover 52% of global population now, increasing to about 65% by 2050. They are responsible for 70% of energy use and 75% of CO2 emissions, with a strong increase expected. As this requires a lot of new urban development, a low carbon infrastructure can be built. 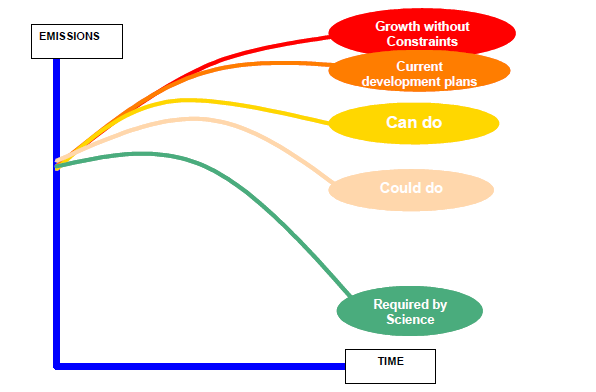 What are effective policy instruments to realize the large reduction potential? Different policy instruments are discussed in the report, but no attempt was made to show best practice approaches that have proven effectiveness. Policy makers would have benefitted from such best practice information, as there is always resistance from vested interests and questions about effectiveness of policy design. Phasing out fossil fuel subsidies (estimated at about $ 470 bn/yr direct subsidies or $ 1850 bn/yr including indirect subsidies) will lead to global emission reduction and economic growth, but is politically difficult to implement in most countries. The use of lump-sum cash transfers to low income groups has proven to be a good way to avoid negative impacts on these low-income groups. The report does not provide much help in figuring out how to make ambitious climate action happen in practice. The messages from the 5th assessment report are not very different from those coming out of the 4th report 7 years ago. So why has climate action been insufficient when all the possibilities were there and costs were low? Without better clues on how to make ambitious mitigation action happen in light of all the barriers in place, the risk is that the IPCC messages will again fall at deaf ears. The report does not provide the necessary insights on how to make it happen. The previous point about a multiple benefit approach goes in the right direction, but was not emphasized much in the SPM. Current investments in climate change mitigation and adaptation are about $ 360 billion per year, most of which goes to mitigation. For comparison: the total annual investment in the energy sector is about $ 1200 billion. Private investment form 70-75% of it. Public funds flowing to developing countries are about $40 billion/yr and private inflow in developing countries also about $40 billion/yr. For a 2°C scenario large shifts in investment will be needed between now and 2030: low carbon electricity generation +$ 150 bn/yr, end-use energy efficiency +$ 340 bn/yr, fossil fuel extraction and fossil fired power plants -$ 80 bn/yr. As investments are mostly private, public policies and incentives should trigger this shift in investment. The report pus emphasis on credit insurance, concessional finance, power purchasing agreements and feed-in tariffs as prime examples of such policies and incentives and also points to the need for an appropriate investment climate. Figure SPM.9. Change in annual investment flows from the average baseline level over the next two decades (2010 to 2029) for mitigation scenarios that stabilize concentrations within the range of approximately 430–530 ppm CO2eq by 2100. Investment changes are based on a limited number of model studies and model comparisons. Total electricity generation (leftmost column) is the sum of renewables, nuclear, power plants with CCS and fossil power plants without CCS. The vertical bars indicate the range between minimum and maximum estimate; the horizontal bar indicates the median. The summary for policy makers of the report is extremely vague on the role and instruments of international cooperation. The full chapter on international cooperation does not provide a thorough analysis of how to make international agreements more effective, which would have been a much-needed contribution to more ambitious climate action.